Suction cup mounted window feeder, 3 ports, featuring high view perch, 8 oz. capacity, and lifetime guarantee. Made in USA. Has the capacity to hold 1/2 quart of seed. Two types of seed can be used in this feeder giving you the opportunity to attract many different kinds of birds to feed at your window. Both trays are easy to remove and clean. 6.5 inch dish with cover and brass rod for seed suet mealworms or fruit. Colorful box attaches with suction cup bar. The Plastic Hummingbird Plastic Feeder holds 6 ounces of nectar. It has a shatterproof reservoir with three feeding ports. It attaches to a window easily. This window seed feeder holds any type of seed or mix. 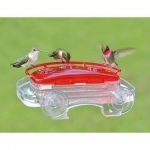 Features include crystal clear design making bird watching easier. All mounting hardware included. Easy to fill and clean. 1 cup capacity. A clear roof over hangs the seed tray to protect seed from rain. The seed reservoir slides out for easy filling and cleaning. The feeder has the capacity to hold 3/4 quart of seed. This virtually unbreakable UV stabilized polycarbonate construction is backed by a Lifetime Manufacturer Guarantee.